Facebook showed me the success he had. All photos of smiling people, distant travel, children with straight teeth, impressive cars. And over the years we met and talked about work. Great guy, smart, very much goal driven, a road warrior like myself. So when he called to tell me they were in the middle of a divorce that came as a shock. Just proofs the problem of Facebook is not all the lying facebook does: we take care of your privacy. Sure. The problem of Facebook is that it forces you to ly to yourself. Keeping up appearances gets in the way of being true to yourself and fix problems while you still can. Just after the divorce, he asked me for advice on changing roles. And now some 6 months after the divorce, he asked if we could have dinner again. Having dinner is the masculine version of asking for help. Asking the older version of the male species, the silverback, for help. Over dinner, we talked about life. When you are young you are convinced older people have no clue. When your halfway in your life you might realize that chasing goals when you are young does not prepare you for getting older. After a divorce questions come up like: what should I do next, my cashflow just halved, how do I deal with that. All the acid in your system when talking about your ex. And the children somewhere in the middle. The risk of what I call Nexting: only looking at the past and the future, not look at the here and now. The adult hurt in the beginning more important than the care for the kids. I explained the power of Today. Adding the word Today. To add perspective. I don’t know what to do. Or: I don’t know what to do TODAY. I feel totally useless or: I feel totally useless TODAY. Now 6 months in, he started to see perspective. After talking till the main course about the past we could address the topic of the future. And I could play my silverback role of asking questions. Questions like: Can you be happy with less money? Is the size of the house the yardstick for success? Not having a car, is that really a problem? Can you now be a better father for your children? And the question that ends it all: can you become a better version of you. And as the answer was yes: can you see the opportunity in all of this, Can you glue back the pieces of the mirror in a new way, a way that allows the better version of you to shine. The meeting I had with my new customer was on the 15th floor of a high-rise. Great view over the port. Clearly an expensive setting. All pictures of celebrities with the CEO in the reception. Their website equally showed pictures of wealth and success. The meeting started with talking about all the new tech. 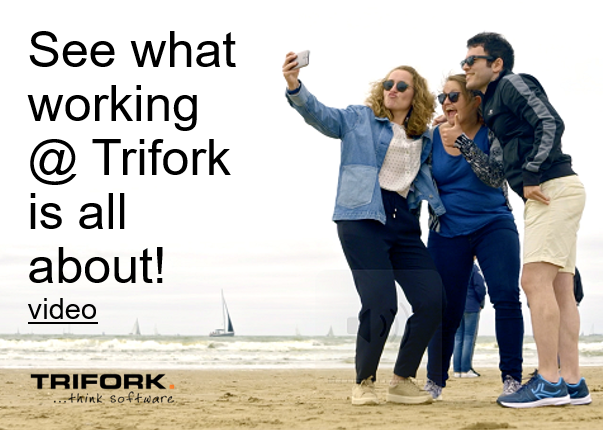 Of the great things, our ever-growing brilliant Trifork machine learning can do with data and AI. Running Machine Learning on the edge with the iPhone, using AR, augmented reality. All the new digital tech we now have at our disposal. And he talked about the projects they started. The proofs of concepts, proofs of value. Just before the first break, he asked me about our approach to digital transformation. So I explained the importance we see in making the tech less important to allow us to also spent energy on business relevance, on integration in the current way of working, on measuring outcomes. And most import: the Adoption is King philosophy. Only if the user, the company, uses the new tech in a business-relevant way, it might be useful. I explained that we are very much Artificial Intelligence ambulance chasers: just the tech does not do anything. You have to use it: Adoption is King. After the break, the discussion about our approach triggered a very different direction for the meeting. He explained their old business models, the old value propositions. How that was still contributing to the very positive cash flow, just look around you he said. And at the same time, his small department was tasked with handling the day after tomorrow. Their customer customers, in a B2B2C way of thinking, would no longer need their product in the near future. Ultimately it would become a free service. So all the talk about new Tech was really just an intro to talking about the real elephant in the room: we need to change our value proposition. We need help to redefine our BMC and VPC. The new Digital Tech become the key element to really talk about corporate survival, about business continuity. And it proves again what we have been talking about for a long time: having 2 separate transformation roadmaps for business and IT does not work, they should be one and the same. New tech should be business relevant. New business should look at IT as an integral part of the new value chain. He extended the meeting with 2 more hours. This broader perspective was what he really was after. And I talked about my dear friend. This brilliant, energetic, goal driven guy. A guy that does not realize yet that he has such a bright future as the facebooks lies of the past and the divorce pain gets in the way of his vision. How a lot of companies are really going through the same divorce pain. Divorcing from old business models, divorcing from old value propositions. And how they might need old silverbacks to let them see the possibilities. Look at digital transformation as a divorce, find some counseling. And allow yourself to see the flipside of the coin, The new chances around the corner. Be a better a father for your company, guide it into the future with the least harm done. And be a better version of your company, pick up the pieces of the mirror. Glue it together with new digital tech, and shine like never before.